Bells Rapids is situated where the Avon and Swan rivers meet in the Northern reaches of the Swan Valley. From the top of the road you get your first glimpses of the idyllic valley that is Jumbuck Hill Park. In the drier months the rapids all but disappear, leaving behind an intricate path of glimmering rock, drift wood and calm pools. The sound of raging rapids is replaced by a soothing trickle quiet enough to here the nature around you. 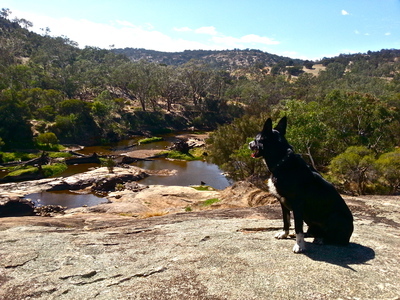 Bells Rapids and the surrounding Jumbuck Hill Park are nice places to take a casual walk around quiet native bushland. 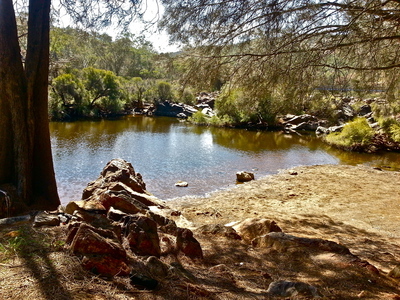 Bordering on Walyunga National Park, Jumbuck Hill includes the upper Swan River Valley and foothills on either side leading up to the Darling Ranges. There are some nice set out walking trails ranging in distance and difficulty. Along the walk you can expect stunning panoramas from the hill tops, old rail lines and a 25-metre cascading waterfall. And unlike Walyunga, you don't have to pay (yet). Many of the deep churning pools in the wet season turn into beautiful swimming holes that are absolutely perfect for a refreshing dip. They're a safe spot for kids and dogs to enjoy the fresh, unpolluted water of the upper swan with plenty of shade around to keep you out of the summer sun. Even those of drinking age can find ways to enjoy the serenity. There aren't many better ways to spend a hot summers day than waist deep in fresh water with mates, inflatables and a few drinks. It's just bliss! The southern bank of the rapids has a small area suitable for practicing 4wding in a safe, controlled environment. While the more experienced may find it a little unadventurous it's perfect if your just getting into the sport. Small hill climbs, shallow mud ruts and uneven ground with nothing that can really wreck your car and hard ground no more than a few metres away at any time. Just don't try to cross the rapids! Summer is arguably the best time for stunning scenic photography. The sun shining over the valley brings out some extraordinary colours and the shadows cast by river bed rocks are very interesting. This is under tonnes of white water in Winter. Still pools, green trees and gentle trickles are very photogenic and taking photos is a lot safer without torrents raging all around you. Winter is the best time for adrenaline junkies to get the most out of Bells Rapids. As the rain comes the Avon swells, turning the peaceful rocky trickle into a compressed torrent of white water fun. from early weather predictions 2013 is looking very promising too! Without a shadow of a doubt the number one activity in the wet season here is white water kayaking. Bells Rapids is the closest place to home adrenaline junkies can put their lives and limbs solely in natures hands and throw themselves down a long, bumpy stretch of rapids. Of course, this all culminates in the well renowned Avon Descent. 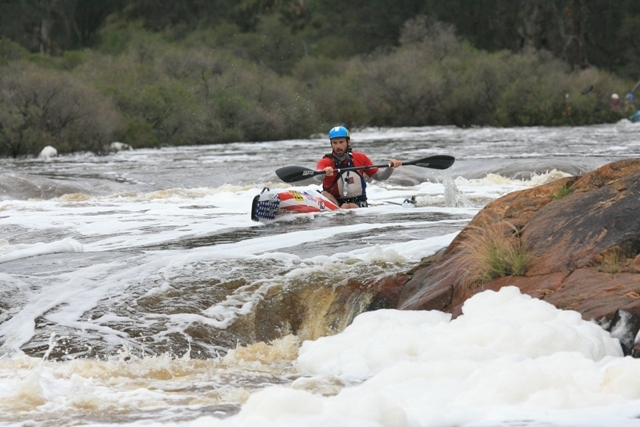 The Avon Descent is held in early March and for the last few years the rapids have been a little disappointing. This year is looking promising though with a return to average rainfall and Bells Rapids is a great place to get the best of the Kayaking and powerboating action. For shutter speed photography lovers winter at Bells Rapids is awesome. There's nothing like fast running water over vibrant rock faces to showcase movement in nature. Whether it's slow or fast shutter speeds your after you'll be hard pressed to find a better natural feature to take them from. Be a little cautious with this one as strong undercurrents can be dangerous, but brave the cold and find the right place to treat yourself to the perfect natural spa. Your best bet is to find some white water flowing over rocks to the side of bigger pools where it's shallow enough to sit. Then just sit back, relax and let nature heal your problems. Just a word of warning - slow down when you see the end of the road. The steep track down into the valley is one lane and blind so really no more than 15kph should be needed. There's no need to rush anyway. Why? 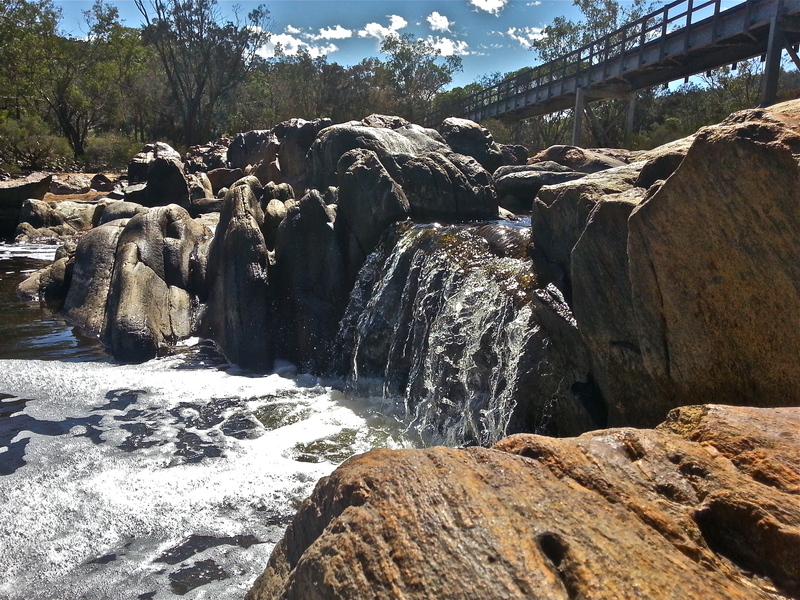 Perth does have white water! Dogs are permitted but remember to keep them on a leash. Hmmmm no leash on dog in photo. Had a great day taking in the senic surrounding with my wife and two young boys. 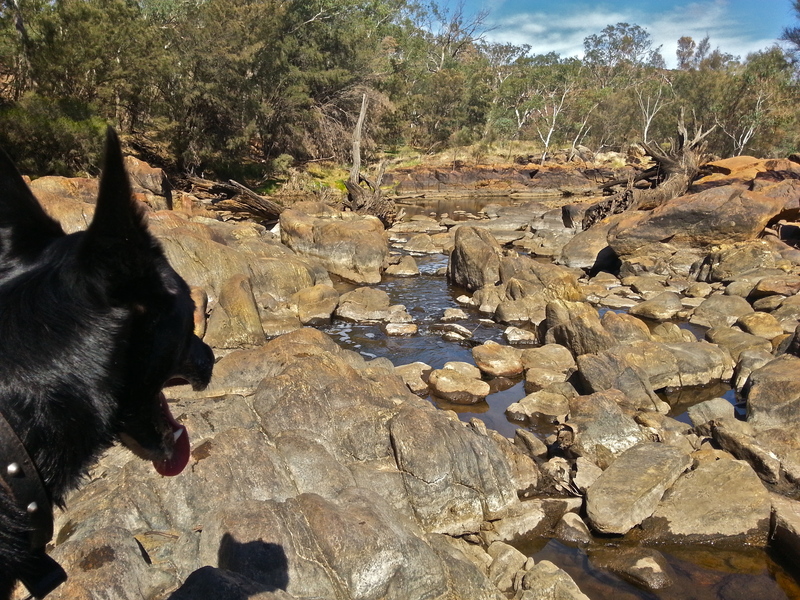 We were parked in front of the toilet block and walked down to the river to have our picnic 30m from where the ute was parked. When we returned to the car we discovered that some lowlife had stolen our bag with the kids dry clothes and also our camera with the day's snaps from the back of the ute. Take care and ensure your belongs are locked up and out of sight. A real shame in such a lovely spot.